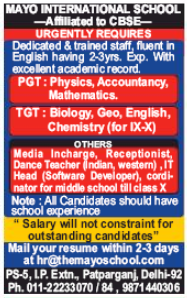 Mayo International School, Delhi has advertised in Hindustan Times Newspaper for the recruitment of PGT plus TGT job vacancies. Interested and eligible job aspirants are requested to apply with in 2-3 days. Check out further more details below. About School: At the Mayo International, we try several ways of bringing a little joy to all of our students. Each child is as unique as his/her unique thumbprint. The real challenge for any education system is to understand the strengths and turn the weaknesses into assets in an individual. Our learning programmes give the children ample opportunity to explore and understand, do and learn, learn and apply, ask and understand. We encourage children to become a responsible and independent citizen with a sense of moral responsibility and self-discipline.